Fueled By Ramen has announced All Time Low as the newest members of the influential label’s incredible roster. The pioneering rock band is celebrating with the release of the new single, “Dirty Laundry,” available today at all DSPs. In addition, the track’s companion video is streaming now at the official FBR YouTube channel. The Maryland-based band has set a truly epic international headline tour that will see them circumnavigating the planet through mid-May. The European leg gets underway March 10th at London’s famed Eventim Apollo and is followed by stops across the UK, Germany, France, Italy, and the Netherlands. From there All Time Low will head out for a much anticipated string of shows in Japan, Australia and New Zealand. 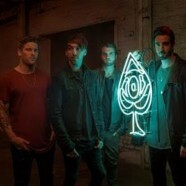 For updates and ticket information, please visit alltimelow.com/tour. Formed in 2003 in the suburbs of Baltimore, Maryland, All Time Low is one of the most beloved bands in rock, acclaimed worldwide for their positivity, invention, and always-effervescent songcraft. The band’s three most recent album releases all made top 10 debuts on the SoundScan/Billboard 200, with 2015’s “FUTURE HEARTS” arriving at #2 – All Time Low’s highest chart placement thus far. In addition, the album debuted at #1 on Billboard’s “Current Albums,” “Top Rock Albums” and “Vinyl Albums” charts as well as at #1 on the official UK Album Chart. All Time Low has also received a remarkable range of awards and RIAA certifications, including RIAA platinum for 2008’s breakthrough “Dear Maria, Count Me In,” and RIAA gold for such hits as “Weightless” and “A Love Like War (Feat. Vic Fuentes).” Other honors include four Alternative Press Music Awards, five Kerrang! Awards, and the coveted title of “Best Pop Punk Band” at the Top In Rock Awards. Known worldwide for their dynamic live shows, All Time Low has been among the hardest-touring bands of their generation, headlining countless multi-band tours over the past decade while also rocking traveling roadshows like Vans Warped Tour and such world-famous festivals as Australia’s Soundwave and the UK’s Reading & Leeds Festivals.